Today we’re going to take a look at Tkinter! I was curious about how one would go about hiding a frame and then re-showing it using Tkinter and I kept finding threads (like this one) that talked about using withdraw() and deiconify() but didn’t really provide any usable code. In wxPython, I did this sort of thing using pubsub. We’ll go over three different versions of how to hide and show the root frame. Let’s take a few moments to break this down a little. We have a simple class where we pass in a “root” object (Tk.Tk()) as the top-level parent. This in turn is used as the parent of the Tk.Frame. The pack() command is one of the geometry managers that Tkinter comes with. It allows you to “pack” widgets into columns or rows and has various options like fill, expand and side. Next we create a Tk.Button and pack it. If you don’t call pack (or one of the other geometry managers) then your widgets won’t appear at all. In the Button instantiation process, we pass it a parent, a string for its label and a command to be run when the button is clicked. When the user clicks the button, we create another Top level window and give it a different title, size and a close button. We use the lambda anonymous method to create the callback as we need to pass the otherFrame instance to the handler so we can close it. We could have just created the otherFrame as a class property (i.e. self.otherFrame) too and skipped the lambda, but if you do much with Tkinter, then you really need to get used to seeing that kind of callback setup. 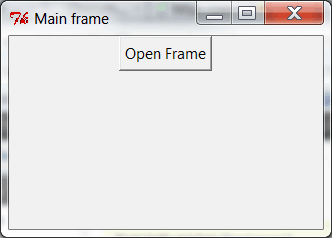 When the close button is called, it destroys the otherFrame and calls the show method, which shows the original frame. Some examples say that you need to call the update() method before you call the deiconify() one, however if you comment out the update() call, you’ll see that it works fine. At least it did on Windows 7 with Python 2.6. Now let’s try splitting the second frame into its own class! Note that in this version, we have to pass the instance of the MyApp class to the other frame so we can call its show method. You can also see that we no longer need the lambda function since we don’t need to pass the other frame instance to the handler any more. That makes things simpler. Still this is a fragile way of doing things. Why? Well if you decide to change the main frame’s show method to showFrame or anything else, then you have to remember to change it in the other class too or it breaks. This can get tedious very quickly if you are passing instances around to multiple classes. Fortunately there’s a simple solution and it’s called pubsub! The “signature” is otherFrameClosed. So if we publish a message with that signature, then the main frame and any other class that has subscribed to that signature will call their respective methods. In the other frame, we add a pub.sendMessage call to the end of our close method where we publish to that aforementioned signature and we pass along a dummy argument. You don’t have to do that, but I thought it would be better if you knew how to pass information between classes. You can pass pretty much any Python object / type that you want to. Now you know a little bit about Tkinter and a few of its top-level methods. You can make your frames disappear and reappear on command! You have also gotten a taste of the power of pubsub. Go forth and code with this new knowledge!